Provide comfort for the family of Junetta Boyd with a meaningful gesture of sympathy. 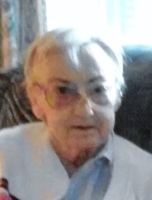 Junetta Elizabeth Mae (Arnold) Boyd was born to James and Mary (Harshman) Arnold on April 27, 1934 in Independence, KS and passed away February 4, 2019 in Springfield Missouri. She was married to H. Leroy Thomas on July 19, 1952 and to this union 3 children were born. Michael and Susan (Gary Hagar), Thomas and Cheryl (David) Vanzant. On November 9, 1991 Junetta married Charles Boyd gaining three step children , Patricia (Richard) Fehlman, Richard, and Robert Boyd. Visitation will be held on Saturday, February 9th at 10:00 a.m. at Greenlawn Funeral Home with cremation to follow. The family would like to thank Integriy Hospice, Springfield Rehab and her aide Brenda Law for their care and compassion during this difficult time. To plant a memorial tree in honor of Junetta Elizabeh Mae Boyd (Arnold), please visit our Heartfelt Sympathies Store. We encourage you to share your most beloved memories of Junetta here, so that the family and other loved ones can always see it. You can upload cherished photographs, or share your favorite stories, and can even comment on those shared by others.